The Roberta Doll Company, Inc. is probably best known for their 1953 LuAnn Simms doll and Roberta Ann dolls. There is not much known about this doll manufacturer, but collectors will find that they made many composition, hard plastic and vinyl dolls that look like other doll makers dolls, knock-off dolls so to say. 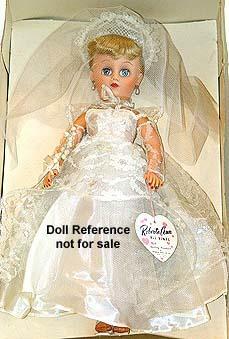 Roberta made character dolls, glamour girls, brides and some baby dolls too. 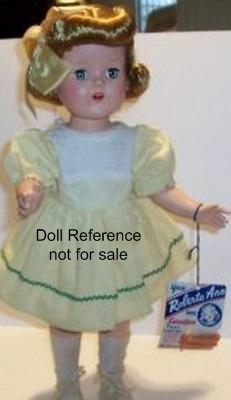 See below for more vintage Roberta dolls identified. ca. 1940s Roberta Teen Doll, 14" tall, all composition fully jointed body, sleep eyes, mohair wig with bangs & braids, real upper lashes & painted lower lashes, closed painted mouth. Ink mark stamped on body Roberta Doll, shown in original clothing. ca. 1940s Roberta Ann doll,16" tall, all composition, fully jointed, blue sleep eyes, mohair wig, real upper lashes, painted lower lashes, open smiling mouth with teeth. Shown dressed in original gown. Doll marked with an ink stamp Roberta Doll. ca. 1950s Roberta Haleoke doll, 16" tall, all hard plastic jointed body, wigged, sleep eyes, open mouth, dressed in a Hawaiian costume with accessories, their were probably other sizes available, too. ca. 1950s Haleoke doll 16"
ca. 1950s Roberta Ann doll, 14" tall, all hard plastic jointed body, wigged, open mouth, sleep eyes, wearing original clothing with hangtag, doll marked Made in USA Pat. Pend. ca. 1950s Roberta Ann doll, 14"
ca. 1950s Roberta Ann Walker doll, 16" tall, all hard plastic jointed body, walker, wigged, open mouth, sleep eyes, wearing original clothing with hangtag. ca. 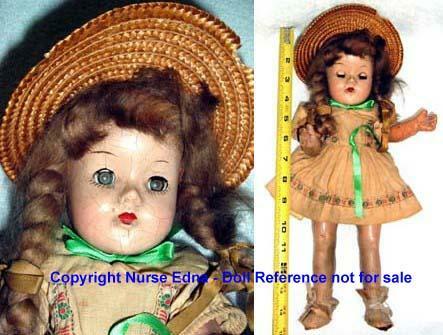 1950s Roberta Ann Walker doll, 16"
ca. 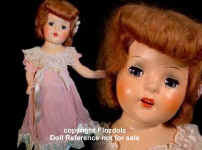 1950s Roberta Ann Ballerina doll, 14" tall, all hard plastic jointed body, wigged, sleep eyes, open mouth. 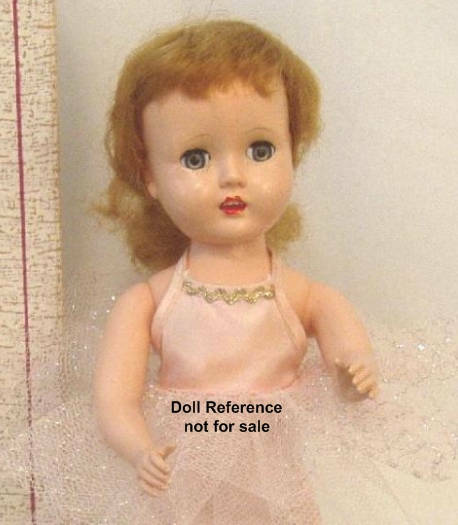 Doll marked; Made in USA. 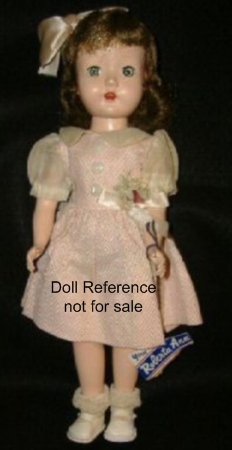 Note many doll makers used the Made in USA marking along with or without a number - so they can be difficult to pin point the exact manufacturer. See the Hard Plastic Doll Marks page for the companies that used this marking. 1953 Roberta LuAnn Simms doll, 14", all hard plastic jointed walker body, wigged, sleep eyes, open mouth, doll marked: Made in USA or Made in USA 170. Also, a LuAnn Simms doll version was made by both Horsman & Valentine. See above note about the Made in USA doll mark. ca. 1957-1965 Roberta Glamour Bride doll, 17-18" tall, hard plastic and vinyl head with rooted hair, sleep eyes, high heel feet, doll is marked: 14RA and below that 818. The 14R dolls were offered by many different manufactures, See the Hard Plastic Doll Marks page for the other companies that used this marking.